Clairaudience is one of the four gifts of inner communication, with the others being clairvoyance, inner knowing and feeling. We all have these four ways of perceiving―you can call them “spiritual gifts” because they truly are. Now, in each of us, one of these four predominates and becomes the main way you take in and communicate out to the world. It helps create your style. These perceptions show up in your communication with others, in your strengths, your niche, your habits, including even your purchasing habits. They are a key to your inner workings and understanding why you feel and act the way you do. In fact, your life makes more sense when you understand the particular order of your gifts of communication (1st, 2nd, 3rd, and fourth). Your Gift of Clairaudience, or Gift of Intuition, hears your inner guidance or angels, often as thoughts, ideas or the “still, clear voice within”. Can you recall hearing those whispers? One outstanding experience in listening clairaudiently (Estelle speaking) occurred in February 2011 when I first arrived at a Wayshowers College winter program in Puerto Rico. As I enter the facility who approaches me first but Patrick Kilhenny. Now, I had managed to avoid him for many years as he, well, set my heart aflutter sometimes, and I did not like that! As I was trying to extract myself tactfully from any conversation with him, something inside said “Why not get to know him better?” At the time, I thought it was my own thought because it was subtle and gentle, but it was actually my Guidance. That’s how this small voice within works! So, I decided to stay, chat, be sociable, never conceiving the end result. That decision changed my life. I married him a little more than a year later. The Gift of Intuition hears inwardly, and someone whose clairaudience is strong will be sensitive to noise. This is a person who listens to the wisdom from within. They want to understand what is happening and like to get the facts, especially the what, when, where and why. You’ll find that they often pick up quick impressions or understandings about people and situations. These are the original thinkers who want to walk to the beat of their own inner drummer. Therefore, many of them tend to run businesses and organizations (or in charge of their part of an opportunity) when they understand it’s best to do. A clairaudient person who is out of balance can be in over-drive, pushing themselves and everyone else. They cannot take pressure, but they can give it. They insist on having life their way. However, with constructive feeling, they radiate a sense of true concern, especially for the big picture. As long as they are relaxed and tuned in, they tend to be loyal to their big picture. And, when following that still, clear voice, they do well. This individual holds firm boundaries. They can be self-protective and introspective, needing some good quality “me” time. Yes, quality is important to them! Other people may find it difficult to get close to them, including their loved ones. This Gift of Clairaudience is also the strongest leadership gift. People who are first in this gift of communication hold a fervent “will-do” attitude that cuts through to the bottom line. When people don’t have understanding about an area of life, they can be controlled by fears and other people who play on these fears. With self-understanding you free yourself and reap fulfillment in your ventures. Some people do not understand these gifts of inner communication and may even think of them as bad and that they should not be used. So, here’s the truth to this: if you feel confused, down or depressed, your inner communication will not work well. You may receive confusing insights. Keeping your energy or attitude clear and positive helps you because you attract to you the same type of energy that you are. If you are solution-oriented, you will attract this into your life. If you are confused or down, you attract that state. So, your claraudience and the other gifts of inner communication work well when you keep your personal energy up. That is one of the reasons why we show people in workshops how to unfold their inner communication abilities and also how to raise their energy so they can remain clear and positive. Next, let’s talk about unfolding your clairaudience in a way that you can receive “right-on” insights. How can you unfold your Gift of Clairaudience to hear better that “still, clear voice within”? Maybe solitude? Doing the things that lend themselves to an inner peace, whether that’s having a relaxing cup of tea, listening to music, or admiring peaceful artwork? Meditation? Also, you can learn ways to be spiritually cleansed and clear, so you are better attuned to that inner voice. If you find you need to quiet your mind, do something relatively mindless, like the dishes, or sweep the floor, stretch or go for a walk. Some of the first techniques we show people in our programs are ways to stay relaxed and spiritually cleansed. These techniques help people remain connected with a higher source rather than confusion or not-so-positive energy. Writers and spiritual leaders, such as Mahatma Gandhi, have often referenced the need to listen to the still, small voice within. You hear about the “still, clear voice” in prayers and the Bible. For sure, it pays to listen! 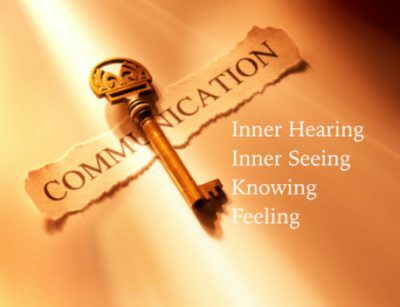 To delve more deeply into these four perceptions you are welcome to view the FaceBook Live series on each of these four gifts of inner communication. You can see the recording on the Guardian Angels Connection FaceBook Page by clicking here. (Disregard the dates mentioned on these FaceBook Live Videos. You can see the current information in the “Events and Programs” tab on this website). Webinars and other online and in-person programs (in certain locations) related to inner communication, angels and life purpose are available. Copyright © 2017-2018, GFI Services Inc. and Alley Copyrights Inc., All rights reserved.